Hicare home doctor(HX-461) is a home use medical equipment or home health care gateway used to collect data from a wide range of devices for determining health status or managing disease conditions and transmit the data to a remote monitoring site. 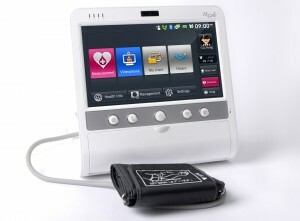 This eHealth manager allows to build health care networks where medical information in the home environment is automatically collected from Bluetooth -enabled medical sensors applying with IEEE 11073-20601 protocol(Blood pressure, Glucose), and transmitted via Internet to eHealth servers in the HL7(ORU-R01) message fomat. It also support the various way of data-exchange and communication between home and eHealth caregivers, such as wired/wireless LAN, USB, and video call.